Cimento proves how desire and determination can achieve something unexpected and surprising when advanced, up-to-date professional skills are placed at their service. For his ambitious project, Luigi Merendelli chose two first-level partners (oenologist Mauro Monicchi and agronomist Laura Bernini). With them he followed a rigorous path that took many years, patience and respect for the time that nature requires to create a sort of oenological “miracle” that few believed possible. The emblem of success of a long process that required a lot of resources and much dedication, is the monovarietal Cimento Pinot Noir. 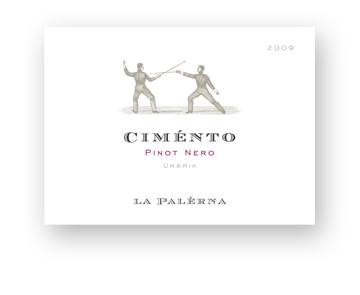 The challenge won by Luigi Merendelli is well summarized in the name given to this magnificent wine – in fact, “cimento” in Italian means “challenge” – and in the label designed by Studio Doni & Associati, taken from a vintage print in which two elegant fencers face each other. Aroma: fine and elegant. Fruity, flowery with spicy overtones of liquorice, strawberry and cherry and a light note of violet. Taste: appreciable acidity, which does not disturb but gives the wine a good elegance, as well as a discreet astringency produced by the tannins. Appreciable alcohol perfectly balanced with the acidity of the wine. Good softness, conferred by aging in wood. The mouth echoes the fruit-driven characteristics found in the nose: cherry, raspberry and strawberry. Pairings: pasta with truffles, duck and semi-aged cheeses. Perfect as a sipping wine.